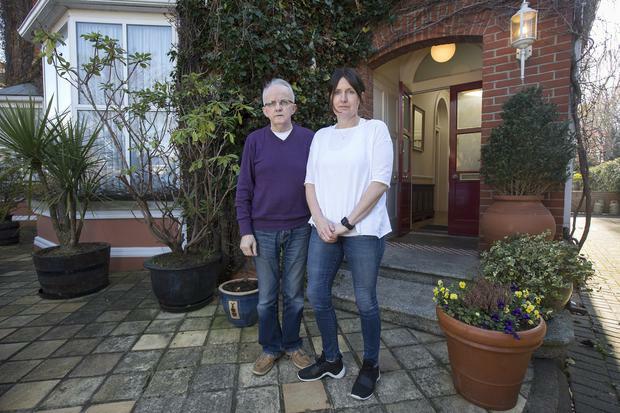 They live in a multi-million-euro property, the Aberdeen Lodge B&B in leafy Sandymount, Dublin 4, and face a colossal level of debt. But Patrick Halpin and wife Ann Keane don’t see themselves as different to other families struggling against the spectre of homelessness. Mother-of-two Ms Keane (47) broke down describing how the family had been unable to take a holiday for five years due to the “constant knocks at the door” as they faced the threat of legal action. When asked why the public should have sympathy for them with the huge figures involved, Mr Halpin (68) stated the €25m borrowed to finance a failed “boutique” hotel was an “unsecured” company loan and should not have been held against their home. “I understand some people might think we are living on Park Avenue in Sandymount and that we are having coffee and going to the beach every morning,” Ms Keane said. US bank Goldman Sachs is trying to take possession of the property. The couple have been in a long-running legal fight with the major global financial institution after falling behind on repayments. A receiver appointed by the US multinational attempted to carry out a repossession order earlier this week. Mr Halpin said: “We just don’t know what’s going to happen next. We need the Irish public to support us against this vulture fund because they shouldn’t be allowed to throw families out onto the street and that is where we are going if they’re allowed to repossess the house and our business. “We literally have nowhere else to go. And we will join all the other homeless families. “It doesn’t make sense because we are paying €5,000 a month from what we earn as a business, so why throw us out on the street?” The debts in this case are over €25m and the property, worth at least €3m, was pledged as security for those debts, a statement from Goldman Sachs said. “We have extensive experience in working with borrowers in a range of circumstances and every effort has been made over a number of years to find a resolution to this matter. We review these matters carefully and have robust processes to ensure our action is appropriate to the circumstances in each individual case,” it added.